Nearly three years since entering parliament after rousing rallies and food handouts, Greece’s far-right Golden Dawn is running a much quieter campaign for Sunday’s election (25 January) from a high-security prison. With most of its top brass jailed pending trial on charges of being in a criminal gang, Greeks have seen little of one of Europe’s most ardent anti-immigrant parties in recent weeks, except for the occasional broadcast and odd leaflet. Golden Dawn, whose leaders deny neo-Nazi sympathies, taps into the same anger at politicians seen as responsible for austerity, wage cuts and record unemployment that is expected to propel the radical leftist Syriza to power. The party’s resilience on Greece’s turbulent political scene, (it ranks as high as third in some polls,) raises the prospect of an imprisoned far-right leader being asked to form a government if Syriza and the ruling conservatives both fail to win outright or form a coalition. 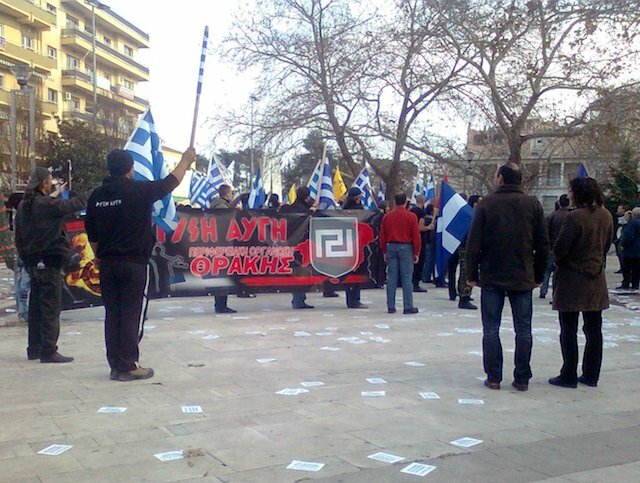 “The television stations might present (our candidates) as knife-wielders, criminals, uneducated, immature but as you can see… they represent the best that Greek society has,” boomed the voice of prominent Golden Dawn lawmaker Ilias Kasidiaris from a loudspeaker at a recent gathering in the town of Koropi, south east of Athens. He was speaking from Korydallos prison, home to some of Greece’s most dangerous criminals, where he is awaiting trial on charges of illegal gun possession. “Golden Dawn is writing Greece’s modern political history and we will be the winners,” he told around 300 enthusiastic supporters packed into a hall where members sang the national anthem and chanted: “Homeland, honour, Golden Dawn”. Kasidiaris, leader Nikolaos Mihaloliakos and five other outgoing lawmakers are behind bars, accused of being part of a criminal group that attacks immigrants and leftists, after a party supporter stabbed a prominent left-wing rapper in 2013. In its manifesto, Golden Dawn, among the furthest parties to the right on Europe’s political spectrum, argues all illegal immigrants should be rounded up, detained and sent home. The party, whose members have been seen doing Nazi-style salutes, also wants tax breaks to boost Greece’s low birth rate to “avoid us becoming a minority in our own country”. Artemis Mattheopoulos, one of the party’s few lawmakers free to campaign, said the election schedule revolved around infrequent calls with the leadership and prison lockdowns. “The last election event we held in Thessaloniki had to happen early because at 8 PM, the prison cell door shuts and communication is cut off so we held the event at 6 PM … so that the leader could speak without being worried that his cell door is shutting,” he said, saying the party was being “gagged”. Seven of the party’s 16 lawmakers are in pre-trial detention and three under house arrest ahead of a trial due this year, as part of a government-led crackdown that was the most significant mass round-up of lawmakers since a military coup in 1967. In the last nationwide ballot – for European elections held barely eight months ago – Golden Dawn polled nearly one in ten votes to secure a comfortable third position. The party, which rose from obscurity to enter Greek parliament for the first time in 2012, is now being challenged by the newly-formed centrist To Potami (River) for third place, but pollsters say support for Golden Dawn could be higher than polls indicate. One of the final surveys before Greece’s last national elections in June 2012 put support for the party at 4.7%, days before it achieved a share of 6.9%. “There is a so-called abstaining voter, who doesn’t disclose who they will vote for to pollsters, and this is a factor for the extremist parties,” said George Siakas, pollster and political researcher at the University of Macedonia. Back in Koropi, Kasidiaris told gathered supporters to cast aside a corrupt Greek elite and send Golden Dawn to a triumphant victory.